The various activities available in the ropes courses can produce powerful memories and provoke deep thoughts and emotions, while challenging physical abilities. Most activities teach balance, coordination, and concentration and foster a great sense of confidence, positive view of self, and leaping beyond the barriers of perceived limits. The degree of difficulty (mental, physical, and emotional) found within each activity is dependent upon the level at which people challenge themselves and can provide a deeper understanding of how to cope and persevere through difficult times and obstacles that life throws at us. 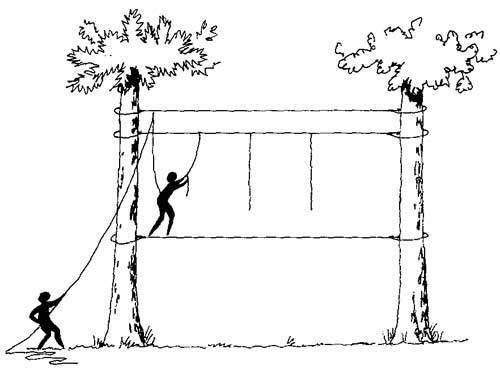 The high ropes course consists of nine elements that are suitable for a range of ages and abilities. Professional instructors provide a safe environment for groups to experience a range of challenges planned specifically for the intention of the group. The Beam (also known as the Cat Walk) consists of a horizontally positioned log suspended between two poles. The belay cable is positioned horizontally above the log and at approximately 3 metres above the log. 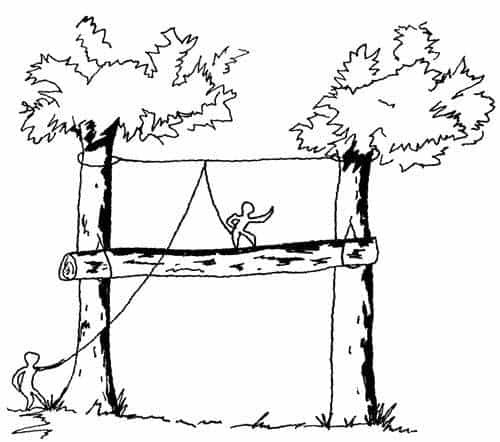 The challenge for the participant is to climb to and traverse the log as far as possible or desired. The Centipede consists of a series of vertically suspended 100mm x 100mm planks of wood which have randomly placed 12mm staples to provide foot and hand holds. A separate belay is located on a separate cable above the Centipede. The challenge is for the participant to climb using the staples as points of contact for their feet and hands. The Dangle Duo consists of a vertically oriented timber ladder suspended from an overhead cable. The timber rungs are 100mm x 100mm H3 dressed timber. A separate belay cable is suspended above the uppermost log. 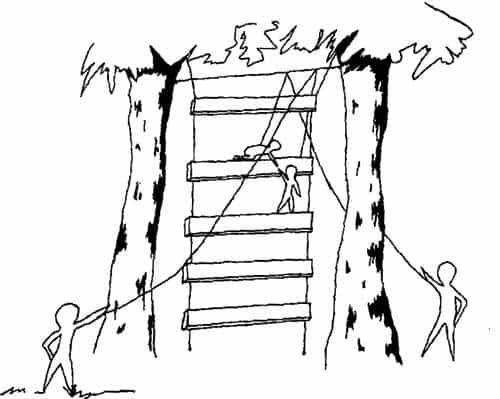 The challenge for the single participant or pair is to climb the ladder using only the support of the logs and/or the other participant. Use of the side cables for climbing is discouraged. The Multivine consists of a single, tensioned foot cable with a series of multi-vine ropes suspended from an overhead cable, positioned just beyond the average persons’ reach. A horizontal belay cable is placed above the Multivine cable. The challenge for the single participant or pairs is to walk across the foot cable using the various support vines for aid. 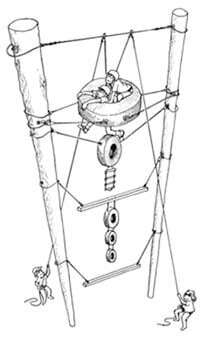 The Flying Kiwi consists of a single belay cable attached to which is a black free wheel pulley and back-up. The activity provides an opportunity for individuals to be raised off the ground while being lifted by their group who are either attached to, or pulling on the other end of the rope. 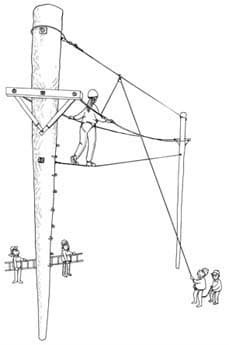 Participants can choose to be raised in the vertical plane, or start from behind the overhead cable and run up to four paces. The Vertical Play Pen consists of a variety of challenges on the upwards climb. From the bottom these are: a section of the centipede hung vertically, a horizontal 100mm x 100mm piece of wood, 1 vertical tyre (guyed at 2 o’clock and 10 o’clock); a short section of horizontally hung rope 20mm long (can be removed), 2 vertical tyres (one above the other) and finally, a horizontally hung tyre. The challenge for the partners is to climb upwards over the obstacles to end sitting in the horizontal tyre. The activity can be attempted by single participants. The Burma Bridge stands out as the easiest high element physically and mentally. It is constructed with a foot cable and a cable for each hand. 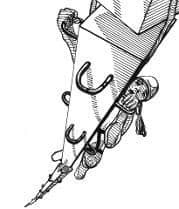 The Postie’s Walk consists of two parallel offset lines strung horizontally (1 foot cable and 1 hand rope) approximately one meter apart between poles. A belay cable is oriented above the hand line, in line with the foot cable. The challenge for the participant is to climb to the element and traverse across, with the lower cable serving as the foot cable, and the hand rope providing support for the hands. Access is from the Beam side of the tree. Care needs to be taken in securing access ladder as level ground is limited. Belayer needs to have a secure stance on the sloping ground. 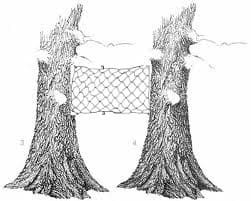 The Cargo Net consists of a large net strung between two trees and is an excellent high element for all ages and abilities. The Cargo Net is challenging but has so many options for climbing. Unlike a Rock Wall, you always have a hand hold and a foot hold which makes it simpler, but no less of a challenge.